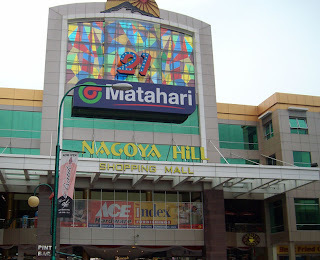 Nagoya hill that was her name ... Nagoya hill is the largest shopping mall and a pride batam city at this time. Nagoya hill shopping mall located in the crowded center of Batam City community, the grandeur and beauty of his building Nagoya hill got a high appeal to everyone who came in batam both local and foreign tourists the country would not forget to visit this mall. Nagoya hill is the most complete shopping in batam, in which there are many booths or outlets ranging from food, clothing, accessories, sports facilities, hardware, furniture, electronics center, and other mobile phone. Food Street is a collection of cafes and local restaurants and cafe franchise like KFC, A & W, Godiva Bistro located in the deep and the front of Nagoya hill. I checked into my comfortable room at a hotel Batam and the first thingwas to hit Nagoya. I spent a day just browsing around, eating and drinking litres of juice.